Dog Walking Service Agreement Contract designed to protect your business from liability.� Click the link for details on what is included in the agreement as well as a sample of what the agreement looks like. Professionally written, well-detailed dog walking service agreement contract catered to your business services. Full Page of Policies and Procedures related specifically to the dog walking business covering areas such as many liability issues, cancellation policy, bad check policy, payment policy, and so much more. You won't need separate forms for each...it is all included on one form to make things easier for you and your clients. 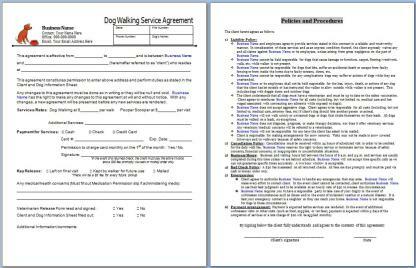 This 2 page contract goes perfectly with all the other forms offered in the dog walking package. It is designed to ensure your clients are not entering the same information more than once. Order with confidence from an experienced dog walker. This agreement will be sent in Word and PDF format. It is completely editable in Microsoft Word and will come with instructions on how to open the file as well as how to edit it (including adding a logo) for your convenience. You may also choose to have the agreement arrive to you with your business information already on it. If you would like us to customize the form for you, we will add your business information and logo (if provided) and send this out to you. This way you are ready to print and go. Forms are an immediate download unless you would like them customized with your business information. If you selected to have them customized, they are sent via email within 3 business days or less. We do not ship the forms. Payments accepted are Visa, Mastercard and Discover. You may also pay with a check, money order or paypal (must contact us for these payment methods).